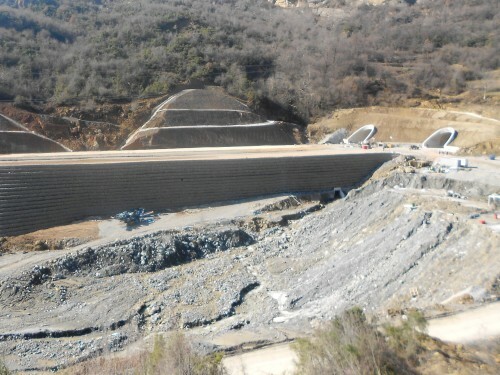 Tirana – Elbasan highway one of the most important highways in Albania, has featured a wide range of Maccaferri products. The highway will connect the industrial city of Elbasan to the city of Tirana, and onwards to the city and port of Durres. It is expected to constitute, in the future, part of the central road axis of Albania that will connect Tirana to Elbasan, Berat and Tepelene. The highway is 12 km long and almost half runs through an urbanized area and then over steep mountains. Maccaferri Balkans worked hard from the begining of the project proposing to the project team our solutions for soil reinforcement, erosion control and river protection works until the main contractor obtained the supervisor’s approval for the project. In this valley, there are lower foothills, which begin at the edge of the city center. The Erzen river flows between these hills, passing South of Tirana. The main Elbasan road follows this river up the broad valley, for about 10 km. After the village of Ibë, the valley is narrower, and the slopes get steeper: the road begins its climb to the ridge here. After the pass, the road follows the flank of the ridge, and then descends into the Shkumbin Valley on a series of closely-spaced hairpin bends. Not only is the road within difficult topography, but additionally it also has challenging geology, wherein massive slides have occurred time after time, and given the heavy traffic, our products and solutions offered a technical, long lasting and value for money answer to the Contractor’s questions, in order to secure travelers and daily commuters. Works and supplies are still continuing. The project is forecasted to be completed within the end of this year. Solutions provided by Maccaferri to Sections 1 and 3 of the motorway project include Green Terramesh, Terramesh System and Geogrids for soil reinforcement structures, Gabions for retaining walls, Reno Mattresses and MacMat for hydraulic and erosion protection and Steelgrid MO (mono-oriented) for rockfall protection works. We will be back soon with news about this project! For more information you are welcome to contact us.